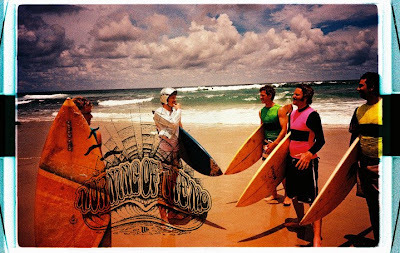 Morning of the Earth transformed the surf movie genre in the late 60s and early 70s as an artistic portrait of counter-culture and alternative lifestyles throughout Australia, Bali and Hawaii. The Morning of the Mo surf event relives the glory days captured by Albe Falzon in the Morning of the Earth surf movie, bringing back the Mo to surf fashion, to help change the face of men's health within the surf community. It's a grass roots event with all competitors required to sport a Mo and ride a pre 1980's stick to enter. 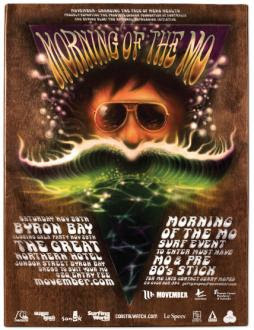 All proceeds of the event go to Movember's beneficiary partners. SURF DAY 29.11.2008Meet at Ballina lighthouse car park 7am for 8am start.Held - Ballina - Byron Shire. Waves permitting. JUDGING & PRIZES BEST MO Wins the major prize. BEST ARRIVAL To Lighthouse carpark judged between 7.00 and 7.30am. STYLEMASTER Best Mo in character throughout the day/night. BEST DRESSED MO SISTA One Day & One Night winner. DANCE OFF Best Mo Bro - Best Mo Sista. EDDIE CHALLENGES From the unique mind of DJ EDDIE throughout the day. CLOSING GALA PARTY 29.11.2009 Great Northern Hotel Byron Bay. See you all Surf Mo Bros there!